Your taste buds will surely relish the taste of the this biryani. Heat oil in a pan, add the garam masala. Then add the onions and some pudina for the fresh aroma. Fry onions till golden brown and add the ginger-garlic paste and fry for about 10 minutes on medium flame. Add mutton (or chicken) and fry till it looses its color. Add salt. Now add chilli powder, haldi and tomatoes and stir for some time. When the tomatoes are soft, add the curds and green chillies. Close the lid and allow it to cook for about 45 minutes on low flame or till the meat is cooked. For chicken, do not close the lid or else the chiken will be overcooked. Add coriander leaves and 3/4 of the lemon juice. The kurma is cooked once the oil separates above the cury. 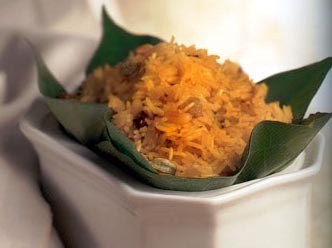 For Rice, Wash and soak the basmathi rice for about 45 minutes. Add the rice and pudina and allow it to be cooked about 3/4th. Strain all the water. Make a pit in the rice and add the khurma into it, and close the pit of rice. Soak the saffron in milk for about 15 minutes and then add it on the rice. You can also add 1-2 tbsp. of ghee on the top to give that really good aroma. Close the lid tightly so no steam can let out. Bake for about 30 min at 325 farenhiet.